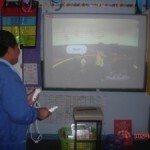 This term I have been using the wiiMusic Game with my class to develop knowledge and understandings about music. Here are a couple of posts from my class blog – 09AllStars – all about what we’ve been doing. We are studying music for the next few weeks, and we will be using the wii to help us explore and experience a huge range of instruments. 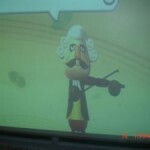 We used our Golden Time today for the intial taste of what the wii can do – everyone had a quick turn at playing an instrument and we all had a bit of a laugh as well. 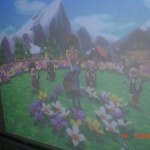 Stay tuned for more posts on what else we are doing with the wii Music. 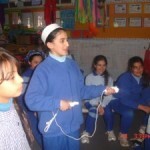 Over the past week we have been playing the wiiMusic in small groups so that we can practise the activities and get better at the games. We have been playing lots of different instruments and hearing and accompanying many different tunes. Its quite hard at times to play tunes that you haven’t heard before. We have found that you get better – and it becomes easier – the more you practice and the more familiar you are with both the instrument and the tune. We have found out about “pitch” by playing the “Pitch Perfect” game – you have to listen carefully to match the notes that are the same, or put the notes in ascending order by listening to them. Sometimes this is hard, and the timer is counting down so you have to hurry! wiiMusic – Perfect Pitch from KimPericles on Vimeo.